Available in a range of reduction ratios. FLEXI-DRIVE is a cable-driven remote operator for valves in inaccessible or hazardous locations. It can transmit drive to valves as far as 60m (200ft) away, accommodating 540 degrees of bends in the cable run. Manufactured by British company Smith Flow Control, the Flexi-Drive is available in Australia from Fortress Systems Pty Ltd. 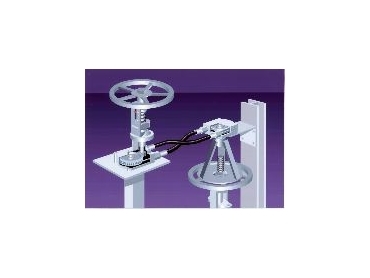 The Flexi-Drive consists of three elements - an operator station (with a geared handwheel and mounting facility), a valve station actuator and a unique, patented 'continuous loop' helix drive cable. Due to the properties of the strong, flexible steel cable, turning the handwheel of the operator station simultaneously operates the valve actuator. The cable allows high valve operating torque to be transferred through tunnels, walls, bulkheads, sewers, floors or any other obstacles between the handwheel and the valve. Suitable for any size or type of valve, regardless of torque or turn requirements, the Flexi-Drive is available in a range of reduction ratios, including 4:1, 2:1 and 1:1, with no danger of delivering over-torque. With a service life of 20,000 valve cycles, the device ensures uninterrupted operation for the life of any valve. It is completely sealed and permanently lubricated, never requiring maintenance. A further advantage is that the gearing system can be 'piggy-backed', allowing more than one valve to be operated from a single operator station. The Flexi-Drive is designed to withstand the most severe conditions. It can operate in temperatures ranging from -54° to +200°C (-65°F to +400°F) and will even work under water to a depth of 15m (50 ft).